green tea: I had forgotten about Domoto Tsuyoshi. I had forgotten about Domoto Tsuyoshi. Wait, let me clarify! 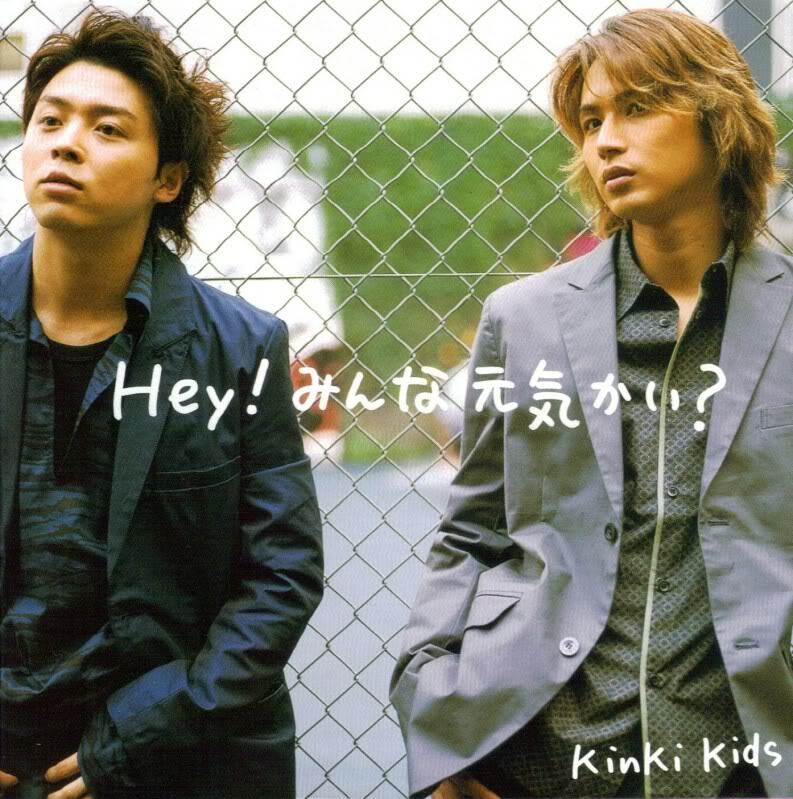 Kinki Kids are the mega-successful Japanese pop duo of Domoto Tsuyoshi and Domoto Koichi. You may recall that I spent time in the Osaka area from 2001 to 2002. Kinki Kids were ubiquitous then. Their songs were playing everywhere. The pair were on TV commercials and talk shows. Domoto Koichi was starring in a musical production. Domoto Tsuyoshi was in a TV drama called "Yume no California" which I watched. I remember in 2002 when KK was awarded the Guinness World Record for the most consecutive #1 singles (13). In those days, I would rent KK's albums from Tsutaya and carefully rip them to my MiniDisc player (!). Several of their songs from that era are really fun, bright tunes and the dual vocals sounded great. In fact, the single "僕の背中には羽根がある/Boku no senaka ni wa hane ga aru/There Are Wings On My Back" is the only song I have ever successfully executed at karaoke so it's my standby. I had a soft spot for Domoto Tsuyoshi then (it's not too bad, the Kids are just one year younger than me although I am admittedly older than their target audience). Even ten years ago, Tsuyoshi had such a distinctive singing voice: very warm and mellow. Undeniably talented even in a pop music context. Also, he always seemed to be trying so hard to do his best. With that eager, full-moon face he seemed like a sweet kid. Almost ten years passed since then and although my iPhone holds several of their songs, it never ever occurred to me to check up on KK. Recently, I was searching online for a Japan-related video and accidentally turned up something that indicated to me that the Kinki Kids were indeed still around. Shock. As is my usual manner when something piques my interest, I embarked on a thorough research exercise. The first surprise was to discover that Kinki Kids are still recording, still performing, still hosting TV shows and so forth. They are still holding onto and building on that world record (now 32 consecutive #1 singles). They must be even more ubiquitous than they were ten years ago. 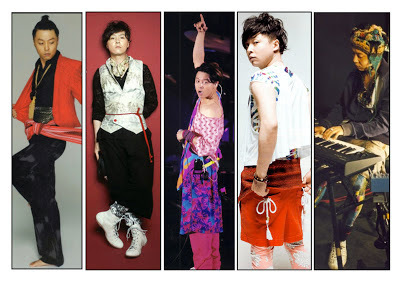 The more interesting discovery for me is that Domoto Tsuyoshi has become quite a star from his solo work. There's a stack of solo albums, all Tsuyoshi's own compositions and lyrics, performed and arranged by him, too. The style is very, very different from the pop duo stuff. Tsuyoshi's music has a very wide range from elegant ballads (see 1st clip below), funky guitar jams with Japanese elements (2nd clip), experimenty-electronic tracks and raw angst (see the amazing 3rd clip, big ending at 5:00). He sometimes also sings with an enka-like voice fluctuation, i.e. a very drawn-out and controlled vibrato. That expressive voice has evolved into something exceptional. 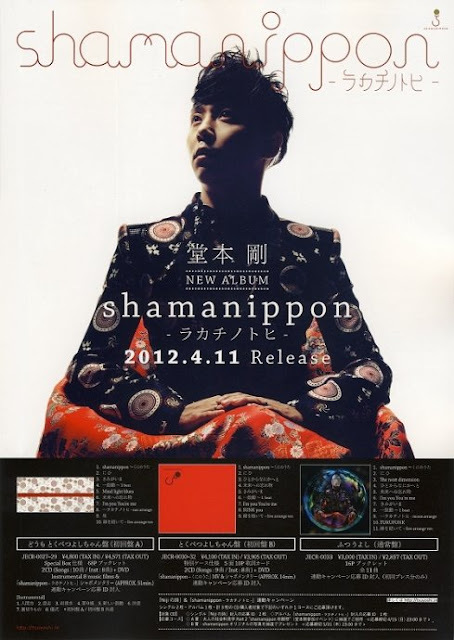 It so happens that Tsuyoshi released a brand new album last month called "shamanippon - ラカチノトヒ". I confess that I downloaded it from an unscrupulous source (no chance to buy it in this country) and I definitely like several of the songs. My favourite track from the album, embedded below, is "ラカチノトヒ/Rakachinotohi" which is backwards Japanese for 'the power of humanity'. Many of the lyrics are backwards sentences. I love the phrasing of this song - part of it sounds like the drone of monks chanting. The other fact I discovered is that Tsuyoshi has become a fashion icon and taste-maker thanks to his flamboyant sense of personal style. I am really surprised and happy to find that someone from that oppressive culture of manufactured pop idols has managed to push through and become a creative and individual talent in the way that Domoto Tsuyoshi has. I'm thinking that this must be very rare. From what I've read, it seems that Tsuyoshi has also been quite open about his struggles with depression and anxiety disorder - I know for sure that is extremely rare in Japan. Good for him for being true to himself. Forgive this media-heavy post - I am genuinely delighted to find another talented artist to follow (and to catch up on). I don't think I have to consider this a guilty pleasure anymore. 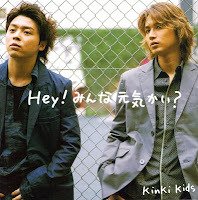 Time - Kinki Kids single from summer 2011. It seems Tsuyoshi dials down the quirk for the pop duo act here. The song sounds like an American top 10 hit - surprisingly so. I do like the vocals and lyrics, though, although you can barely hear them. The video is a bit ??? however, and not solely because of the heavy filter concealing all evidence that the 'Kids' were 32 at the time. Two English subtitled episodes of 'Domoto Tsuyoshi no Shoujiki Shindoi' [Domoto Tsuyoshi's Honestly, It's A Pain]. The concept of this show seems to be that Tsuyoshi and celebrity guests go around doing various activities with no specific agenda. It's very low-key for Japanese TV. it's like a review of Domoto Tsuyoshi, a nice review. Once again I've been reminded of How great he has become.